If you're searching for the best tool bag, then you've come to the right site. I know how frustrating it can be to have your tools scattered all around, and it's just more convenient to have a nice bag for them. In the following guide, I review the top tool bags available. In the market, several tool bags available, so how do you decide which one is right? A tool bag is more than just an ordinary bag. As they've been designed to store tools, so they're more accessible. They're more durable than regular bags and have been specially optimized to maximize use. Tool bags have become more common and can be purchased with a few clicks, but you have to choose the right one. The Veto Pro Pac is an all-weather tool bag for home and professional use. Fitted with heavy duty zippers and fasteners, the Model XL is the leading product on the Pro Pac line. The bag has 800 PVC impregnated denier for the body and a 3 mm polypropylene water-resistant base, allowing you to use it in different conditions. 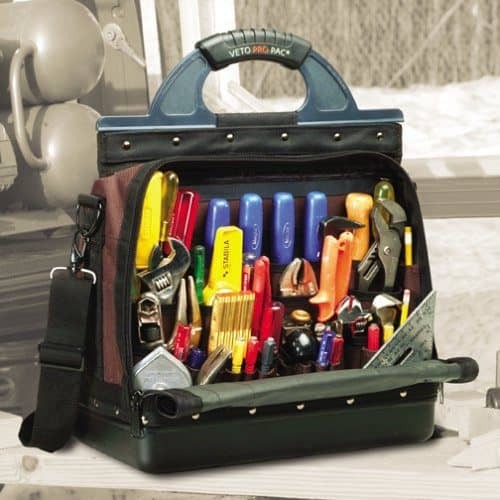 The bag has room for 100 hand tools, and it has 61 vertical pockets for an assortment of tools. You also get half a dozen zippered pockets. The bag comes with an over molded grip and the shoulder strap is nonslip so no need for frequent adjustments. 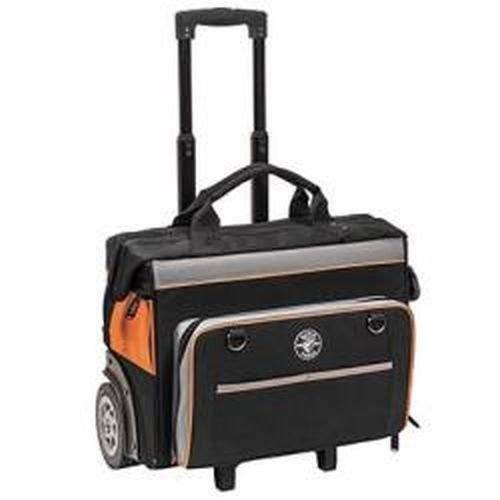 The bag does a good job of storing an assortment of tools including driver bits, paint can openers and so on. Not only are there plenty of bags, but they're easy to use. The LeatherCraft 1579 is built for homeowners, and even carpenters will find it useful. Like the others in the LeatherCraft series, the bag has a unique set of features. From organizing tools to ergonomics, you get a little bit of everything. The bag's organizer has a hidden internal pocket you can use for knives and other utilities. While made of plastic, the organizer is durable and can withstand heavy duty use. There are vast spaces in the bag's main compartment so you can quickly access the tools. The tools are not only just easily available but also visible too. So it's more convenient. With Custom LeatherCraft Toolbox, you can fill the bag up and not worry about how to access the tools inside. A detachable divider is included, and you can slide the frame so you can customize the bag to your liking. The tool bag comes with a shoulder strap and a metal handle and shoulder strap. The handle has foam in the grip, making it easier to carry around. 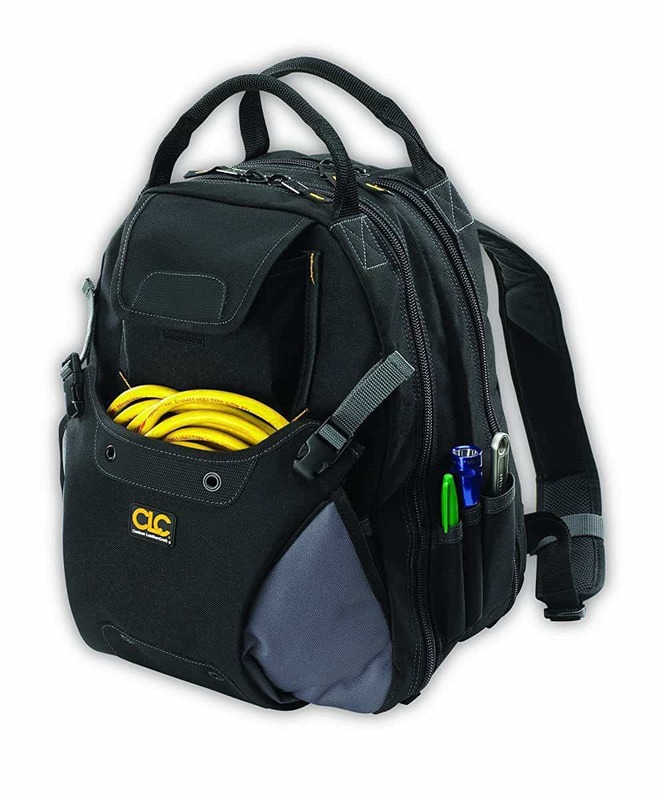 The Klein Tools Tradesman Po is an all-around bag for use in your home or workplace. There are various models to choose from, but they all have unique features that make them useful. The bag is equipped with a molded kick plate to safeguard the bag and the contents. So even if it gets bumped around a bit, your tools will be protected. The Tradesman Pro comes with a durable telescoping handle for easy use. One of the problems with most bags is they have a flimsy handle, but the one here is made from tough materials. One of the characteristics of the best tool bag is its durability, and that is what the Tradesman Pro offers you. With this bag you get 600D ballistic weave. So it is more durable. The bag has 24 pockets for an assortment of tools. The interior of the bag is a bright orange so you can quickly see the items inside. Even if you can't fill the pockets up right away, you'll find them useful later on as your tool collection grows. The Custom Leathercraft 1134 Tool Backpack is a durable bag that even professionals can use. According to Leathercraft, the bag is ideal for use by technicians, installers and pretty much anyone. Aside from large tools, you'll also be able to use it to arrange pliers, wrenches, screwdrivers and other tools. The 1134 bag has sizable pads so you're comfortable carrying it. You can also adjust the shoulder straps to suit your liking. Even if the bag is full it won't wear you down. The bag has a couple of zippered compartments, and they have lots of pockets so you'll be able to arrange your stuff. Its large pocket is enough for keeping a laptop, but there are also small compartments for your pens. There is a large pocket at the top of the bag where you can store your most frequently used tools. The front pocket is also a good place to keep your extension cord so it's within reach. Let's you take a look at what it has to offer. 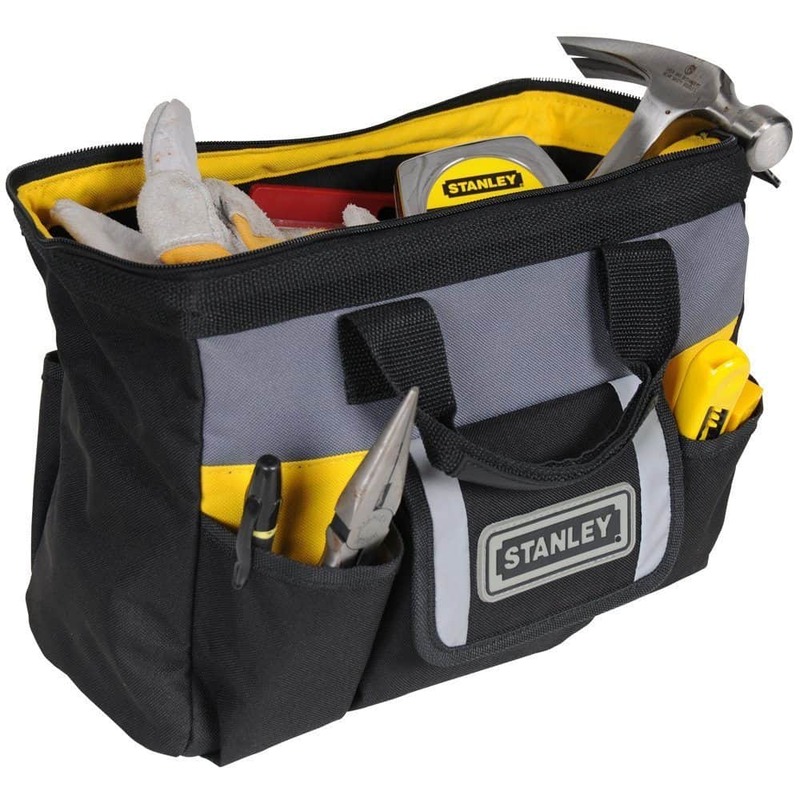 The Stanley Tool Bag is designed for long-term use, both or home and work, and you get a lot of useful and practical features including the following. The bag is equipped with an adjustable strap, giving you quick access to the tools inside. You may need to carry the bag long time. In this case, the comfortable strap will make a huge difference. 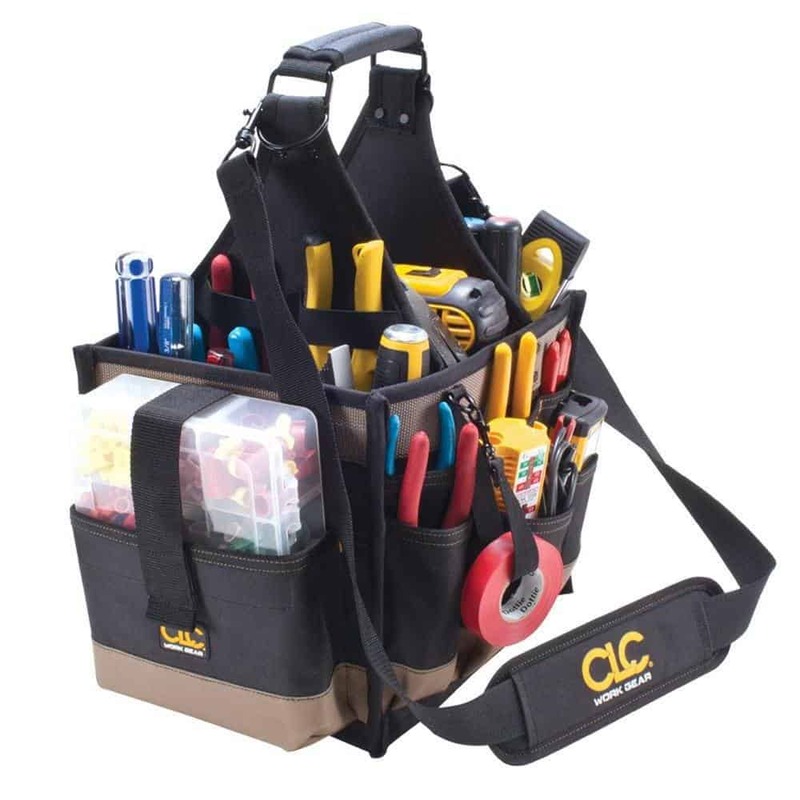 The bag is ideal for storing hand tools, and you can also use it to store small and medium items. The bag also comes with outer mesh pockets where you can store accessories, small tools and other items. The handles are comfortable and padded so that you won't feel any pressure carrying the bag. A large, tool filled bag can be a chore to carry, so having high-quality handles is going to make a lot of difference. The bag has rubber foam bottoms to protect the items inside. Even if you accidentally drop the bag the items will remain in place. More importantly, a few bumps won't affect the contents inside. The LeatherCraft 1528 was designed expressly for storage of various tools. Its unique design and numerous pockets make it easy to arrange the items inside, plus there are lots of pockets. There are 7 interior pockets and 16 outer pockets, giving you lots of room to organize your tools and accessories. The bag is made from durable materials, and the box-shaped design means it's not going to topple over. There's nothing worse than having your bag tip over after storing everything, the bag tips over, so the stable base is a plus. The bag has extra padding on the handle. You can adjust the shoulder strap. So you can feel more comfortable. A bag filled with tools can take its toll on your shoulders, so the strap helps. The 1528 bag has divided pockets to accommodate tools of varying sizes. These divisions ensure you don't mix things up, and the pockets come in different sizes to accommodate various tools. 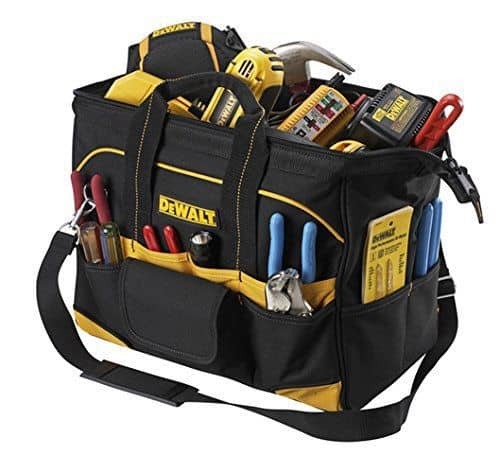 Dewalt has manufactured a lot of quality products, and the Tradesman's Tool Bag is one of their more efficient products. The large opening on the bag means you'll have an easier time putting tools inside, and the spacious interior keeps the items organized. If you carry a lot of tools, access is going to be crucial. The bag has fortified edges and corners, and the pads on the bottom provide additional protection from wear and tear. The bag also comes with nonslip handles and nonslip shoulder straps so it's comfortable to carry. The bag has 13 pockets including one with zippers so you can keep your valuables secure. The numerous pockets also mean easier access to the tools. There is a total of 20 exterior pockets which allow you to store plenty of hand tools, screws, nuts and bolts and more. One of the pockets has a flap with a loop closure and hook, and they're built to last. How many tools are you going to put in it? Check the bag's dimensions and more importantly, what type of tools fit it. Some of these bags are meant for hand tools, while others are for power tools. You make sure the bag has hooks or compartments for specific tools you're going to put in it. 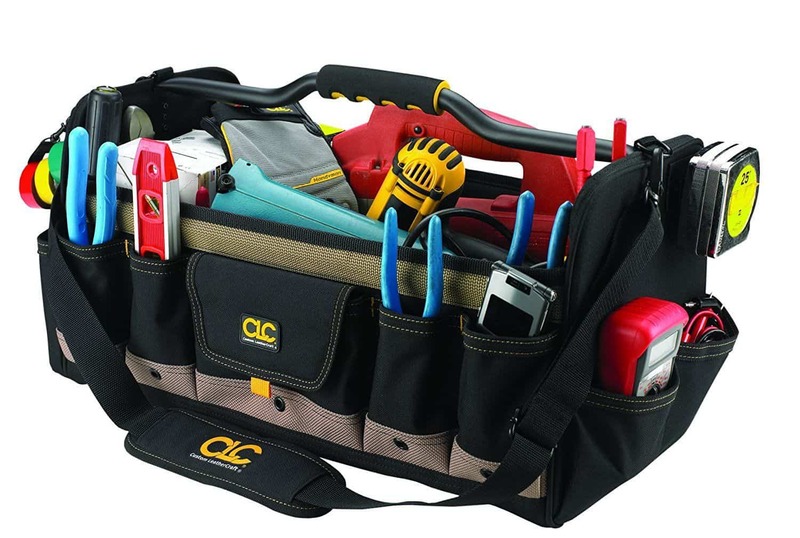 A tool bag must be made of heavy duty materials to arrange the tools and handle wear and tear. Look for a bag with heavy duty zippers and fasteners. These bags may be more expensive than an ordinary bag, but it's a worthy investment. The debate between tool bag and toolbox will go on forever, but the fact is most tool bags are lighter and easier to carry. You don't want to compromise when it comes to quality, but lightweight must be factored in too. The tool bag should be comfortable to carry and provide you with easy access to the contents inside. Small pockets for screws are also ideal. How many interior pockets does the bag have? Are they zippered? How many exterior pockets are available? Are the pockets easy to access when you carry it? There used to be a time when tool bags were only for professional workers. However, DIY enthusiasts and even the weekend carpenter now find them useful. If you've never used one before, now is a good time to do it as there are more options available. That's why I recommend the tool bags mentioned above. Each one has been designed specifically to keep your tools stored in one convenient place. If you've had enough of continuously searching for your screwdrivers and other hand tools, you'll need a tool bag. Just choose one of the bags I reviewed and you'll have a tidier workplace and more convenient access.